Bluefin Depot is a multiplayer stage in Splatoon. It is an abandoned coal mine with railway track above it. A river splits the stage down the middle, with the spawn areas connecting the left and right paths. Bluefin Depot is an abandoned coal mine consisting of four different levels, the two uppermost most of which can only be accessed by the enemy team by grated walkways. The lowest level is divided by a body of water and requires traversing the third level to switch parts. The lowest level of Bluefin Depot is most likely where most of the fighting between the two teams will take place. It consists of two platforms that are separated from each other by a small body of water that cannot be jumped over. The level just above the lowest level of Bluefin Depot is where all traveling between both sides of the level below is made. Chargers cannot snipe too much from here, mainly because of the iron bridge running over the middle of the map. Each team's base is comprised of a top level and a bottom level. The top level is where players respawn; it can only be reached via a grated walkway in the middle. The bottom level is where players can get to the different sides of the depot and can only be reached by a grated walkway on the opposing team's right. In Rainmaker, a box and grated walkway leading up to this section are added on the left. In Ranked Battle, specifications for the terrain or placement of objects are different between the modes; these changes create new paths or new objects to take cover behind. 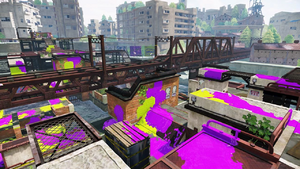 The Splat Zone in Bluefin Depot can be found on the side that is closest to the ocean. Two ramps leading towards the Splat Zone are located on the other side of the map. Walls have also been added on both sides of the map to help each team attack the other team, and for mobility. Blocks have also been added to the bottom level of the bases prevent sniping from each base and to the lower level to even the ramp located on each side. In Tower Control, the tower starts in the center above the water. Once claimed, it will move to the right and up the walls. Then, it crosses over to the left side and continues up until it reaches the goal. In Rainmaker, the weapon is located in the middle of the map. The control points are directly in front of the spawns on each side. In Rainmaker, there have been a few changes to the map, most notably the middle where the weapon is located. There are pathways as well as a platform where the Rainmaker sits. There are also ramps where players can get on each side of the map with ease. Bluefin Depot was made available on 20 June 2015 at 02:00 UTC. Fixed an issue that allowed players to move inside certain objects in Rainmaker mode. Callie and Marie announce Bluefin Depot in the North American version of Splatoon. Bluefin Depot in an Octo Valley Mission. An Inkling with a charger shooting at another Inkling below. Blue Inklings moving in on orange Inklings. Two butterflies at Bluefin Depot. The sunset at Bluefin Depot. A lone jellyfish seen across the water. Jellyfish at the wall of Miiverse posts. Another jellyfish at the wall of Miiverse posts. Bluefin Depot as seen in the Prima Official Guide for Splatoon. The added bridge in Rainmaker mode. Promo for Firefin at Bluefin Depot. Evening and night variants of this map exist in Octo Valley, in the missions Octoling Uprising and Undeniable Flying Object respectively. At the end of Undeniable Flying Object, after the Octostriker has been defeated and the music stops, some unusual sounds can be heard: an erratic clanking and a faint moan, which are slightly louder towards the edge of the UFO. These sounds are also heard when using Recon to explore Bluefin Depot during a Splatfest. Given Callie's comments on the stage, they may be the result of paranormal happenings or simply the deterioration of old structures. The map's name is a reference to the real-life bluefin tuna. Bluefin Depot was indirectly revealed in the Splatoon Nintendo Direct when the GamePad map of it was shown. Bluefin Depot and Saltspray Rig are the farthest stages from Inkopolis and can only be reached by train. According to the first artbook, Bluefin Depot is an abandoned coal mine, where it functioned before the Great Turf War and was abandoned fifty years later. It had since then been occupied the Octarians before being sealed off and used for ink battles. The internal codename for this stage in the game files is "Ruins". In the Octo Expansion, Pearl references one of the rooms with the four thangs, Cap'n Cuttlefish refers to Bluefin Depot. ↑ Splatoon on Facebook. Splatoon (2015-06-19). Retrieved on 2015 June 19. ↑ SplatoonJP on Twitter. Splatoon Japan (2015-06-19). Retrieved on 2015 June 19. This page was last edited on 12 April 2019, at 16:44. This page has been accessed 28,442 times.